Four years ago, the Supreme Court’s decision in Citizen’s United Vs. FEC made it possible for corporations to spend unlimited amounts in election campaigns. If you’ve ever wondered why Congress is broken, look no further: they’re following the money now instead of governing the country. 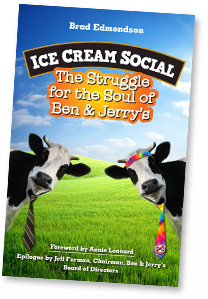 Well, Ben and Jerry have something to say about that. They are two years into Stamp Stampede, a campaign to get money out of politics by stamping messages onto money. To join the Stampede, all you have to to is buy a rubber stamp that prints messages onto currency, such as, “Money Is Not Speech,” or, “Not To Be Used For Bribing Politicians.” Then tell your friends. That’s it! One Response to Join The Stamp Stampede!